Doris Catherine Bayley - Edmonton's Burial & Cremation Professionals | Trinity Funeral Home Ltd.
Doris Catherine Bayley passed away on Friday, January 27 in Edmonton at the age of 73. Doris was predeceased by her husband of 54 years, Robert (Bob). She was born in Port Alberni, BC, grew up in the Debolt area, and lived most of her adult life in Edmonton. She enjoyed a variety of sports including curling, golf and watching the Eskimos & Oilers play. She is survived by her daughters, Colleen Bayley, Lois (Tom) Lemke, and her son Scott. Doris had 7 grandchildren Jared Cleveley, Danielle (AJ) Marcus, Shawn (Tristina) Cleveley , Kyle and Miranda Lemke, Hunter and Hayden Bayley. 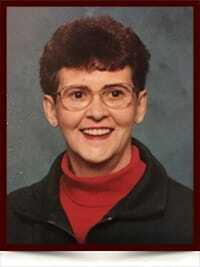 She additionally had 4 great grandchildren, Kaleb and Olivia Cleveley, Ryland Cooper and Cael Cleveley. Doris was also survived by her siblings Doreen (Jim) Klassen, Betty Hirsch and Calvin Leveille. She will be missed by all who loved her. I just learned of her passing. Please pass my condolences to the family. She was a good neighbor and a lovely woman. Always enjoyed talking to her. I’m so so sorry for your loss she was one of a kind and I will miss her so much.. So very sorry to hear about Doris passing. At least she’s not suffering any more. My condolences to her family. I worked with Doris for many years and she was one of my favourite realtors – always had time for a quick visit and a big smile. She was so proud of her family and loved to talk about the grandkids and great-grandkids. I know she will be much missed and I will remember her so very fondly. My deepest sympathy to the Bayley family. Will miss you Doris. Rest In Peace. I met Doris at our On Line computer Club at Seesa. She was always so cheery and friendly. Doris was quick to ask a question and enjoyed herself learning new skills. She loved her family, talked of them often, and I am sure left you all with many happy memories with her enthusiasm for life.My sincere sympathy in the loss of your mother, grandma and sister and friend.